I love the Pacific Northwest Coast. Well, truth be told, I like the Mexican coast better BUT, it’s a bit more practical for me to spend a long weekend in the Pacific Northwest. I flat out love the ocean, whether it’s warm or cool weather. I could sit and watch it for hours and just feel soothed by the rolling waves. 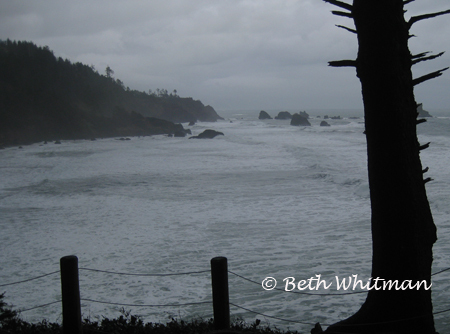 But the reason I love the NW coast so much is because of the dramatic weather that so often occurs. Jon and I scooted down to Cannon Beach for a 3-day getaway recently and I was reminded how wonderful this area is. It’s so accessible to Seattle and environs, yet so different than the city that I’m transported and unplugged in no time. We stayed at The Ocean Lodge, which was so fantastic that I deemed it worthy of it’s own post. It really was the mo st special place I’ve stayed along the Oregon coast. 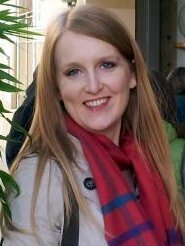 It was a combination of feeling welcomed by the staff and the relaxing environment that included numerous fireplaces, a library and a bottomless jar of cookies! We happened to be there on a weekend when the tides were at extremes. Several locals warned us not to turn our back on the ocean as it had been coming up higher than usual and people weren’t used to it. During the late morning hours, indeed, the waves were bigger than I’ve ever seen. And, the low tide gave people the opportunity to walk out to Haystack Rock and view the sealife. Of the many times I’ve been to Cannon Beach, I’d actually never taken the time to visit Ecola State Park. Wanting to do more exploring this time, we headed over to this park located at the north end of town and went for a hike. Though it was a bit drizzly making the path muddy, the forest provided much-needed cover on the route that clung to the coastline. 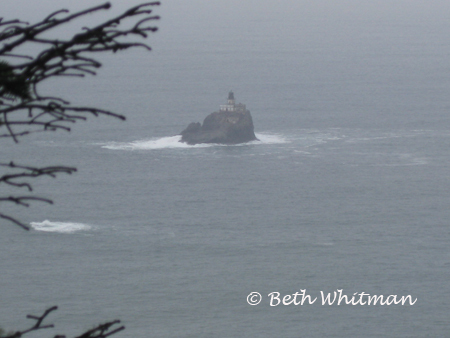 The views of the lighthouse and the seastacks were spectacular, despite the bad weather. The approximately 4-mile hike that we took, was just the right length on such a day. 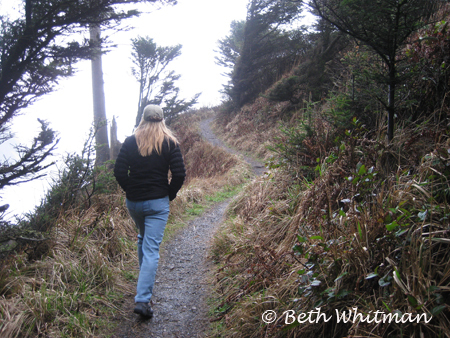 But, Ecola has trails that will bring heartier trekkers farther up the coast. We’ll definitely return when the weather is nicer but I know we’ll be fighting crowds then. The folks at the Cannon Beach Visitor’s Bureau arranged for us to visit the Arch Cape Inn and Retreat for a glass of wine and a tour. 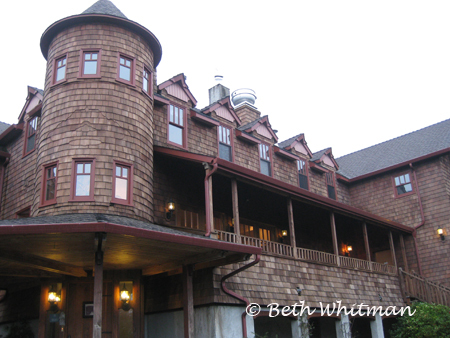 The Inn is located about 4 miles south of Cannon Beach and is perched on a hillside, with a view of the ocean. Although the website describes it as “boutique lodging”, you almost feel as though you are in a grand castle. Cannon Beach is located about 3.5 – 4 hours from Seattle and just a couple of hours from Portland. It can be difficult to find lodging during the summer (especially during festivals such as sandcastle day in June) so book well in advance. Ya never know what the weather is going to bring so be prepared with a rain jacket and plenty of books so you can hunker down indoors if it’s raining hard. If you’re like me, you’ll love the weather drama that most seasons bring!